Liberty, Justice, and this old guy called America walk arm in arm. Are they marching towards a sunset, or a sunrise? My declaration in this painting is that the horizon is bright, that every morning in America is a new day full of promise and possibility. The values upon which our nation was founded have always had obstacles, but the values themselves endure, come what may. We are currently enduring a time of great division in this country. It is not the first such division, nor will it be the last. Indeed, our Democratic Republic was designed to utilize the divisions inherent in human perception. 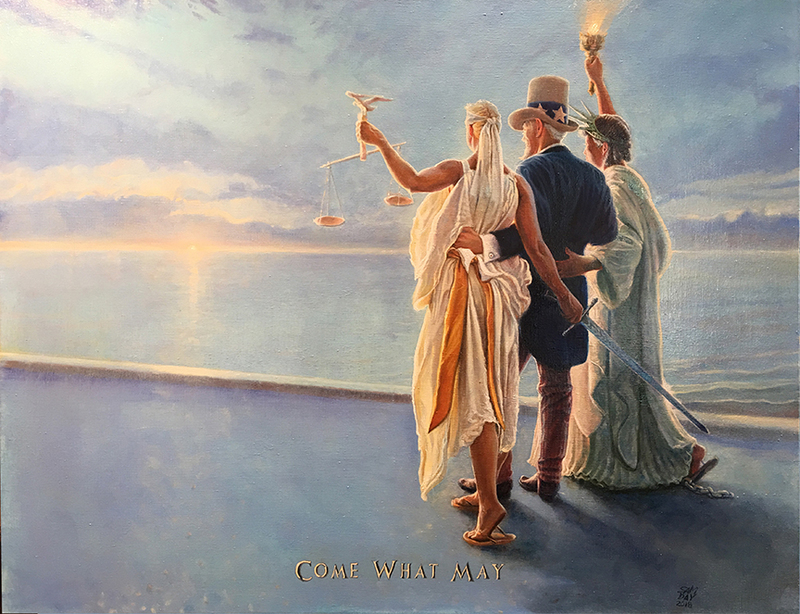 Americans on the right and the left of that divide will see different hopes in this painting. But it is my hope that both sides will see hope. For our system to function as designed, both sides must have hope that our values have a future.